Tuesday is not my night to cook. Sometimes. While I love all the grocery shopping, recipe research and time spent in the kitchen that goes into crafting our meals, there are some nights when I just don’t want to thing about making dinner. With this in mind, I pitched an idea to Chris a while back — Wild Card Tuesday. 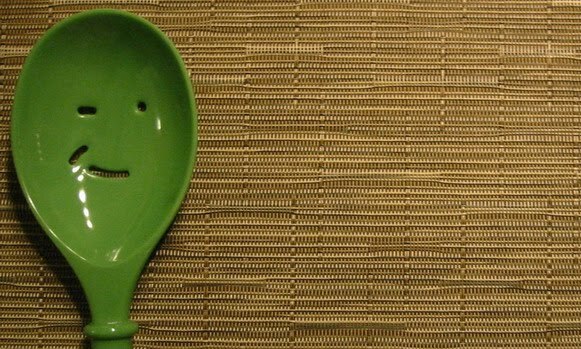 In theory, Chris would be responsible for coming up with dinner plans each Tuesday. Homemade, pick up or dine out, doesn’t matter. I just want one night a week where I’m not walking straight through the front door and into the kitchen after work. In practice, Wild Card Tuesday might not happen every single week, but when it does, I absolutely love it. I know cooking isn’t the special man friend’s favorite pastime, but I appreciate when he humors me. 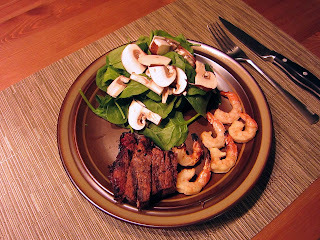 Tonight I got some delicious grilled surf and turf along with a salad of spinach and mushrooms. He did the shopping, the grilling, the dishes. The only time spent in the kitchen was when I walked through it on my way into the dining room.